If you are lucky or have flexibility on the dates it can be interesting. Please Note: Last season for July and August almost all the cabins were booked a few months before the season started... So we advise you to book as soon as possible (also often better for cheaper flights). 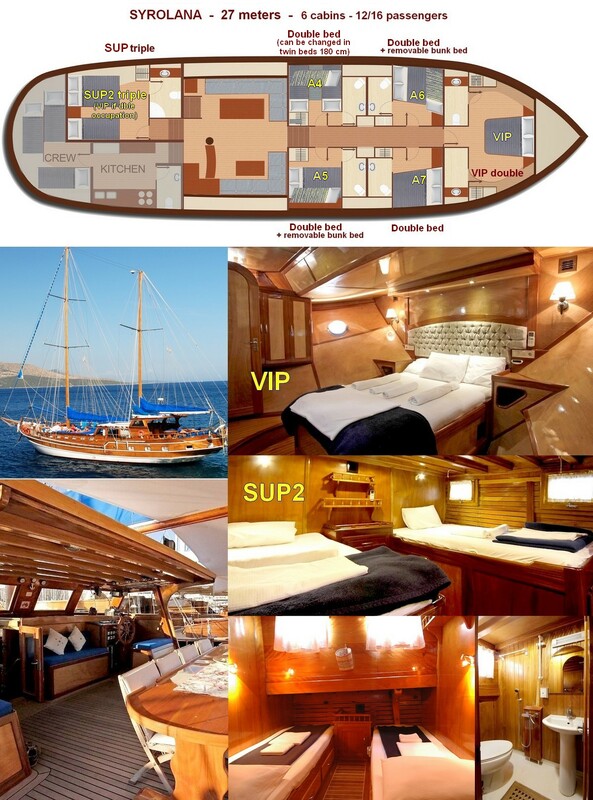 Prices are Per Person for a double cabin with all taxes, yacht expenses and costs included, except half-board and crew tips. For all our Cyclades cruises boarding is the Saturday evening at 7pm in Mykonos or Syros and yacht leaves the Sunday morning. You will leave the yacht the next Saturday morning after breakfast (or earlier if you have a flight early). For July and August cruises in Ionian and Sporades (to avoid strong wind of Cyclades during these 2 months), transfer is provided from Athens Airport the Saturday at 4:30pm and you will be back at the airport the next Saturday before 1pm. For Sporades and Ionian itineraries, transfer from Athens Airport to the yacht is organized the Saturday at 4:30pm and you will be back the next Saturday around 1pm. 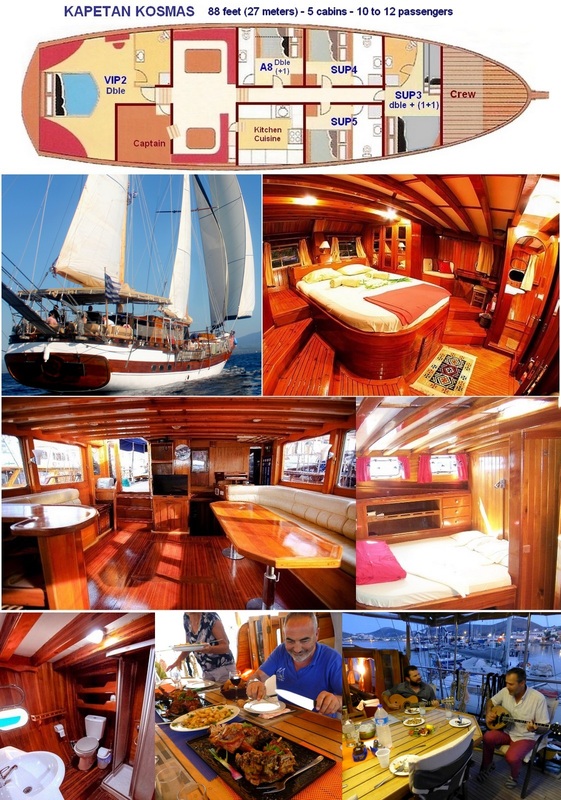 In high season the triple+1 SUP3 cabin on the Kapetan Kosmas is charged 2,67x1870 for 2 or 3 guests, 3,17x1870 for 4. One transfer from Athens Airport to the yacht is organized without extra-fee the Saturday at 4:30pm at the Airport and back there the next Saturday before 1pm. Choose your dates and itinerary, let us know which cabin(s) you wish (A, B, C or Sup/VIP) and ask one option for cabin(s), when you can choose between Green and Blue, opt the Green period please. 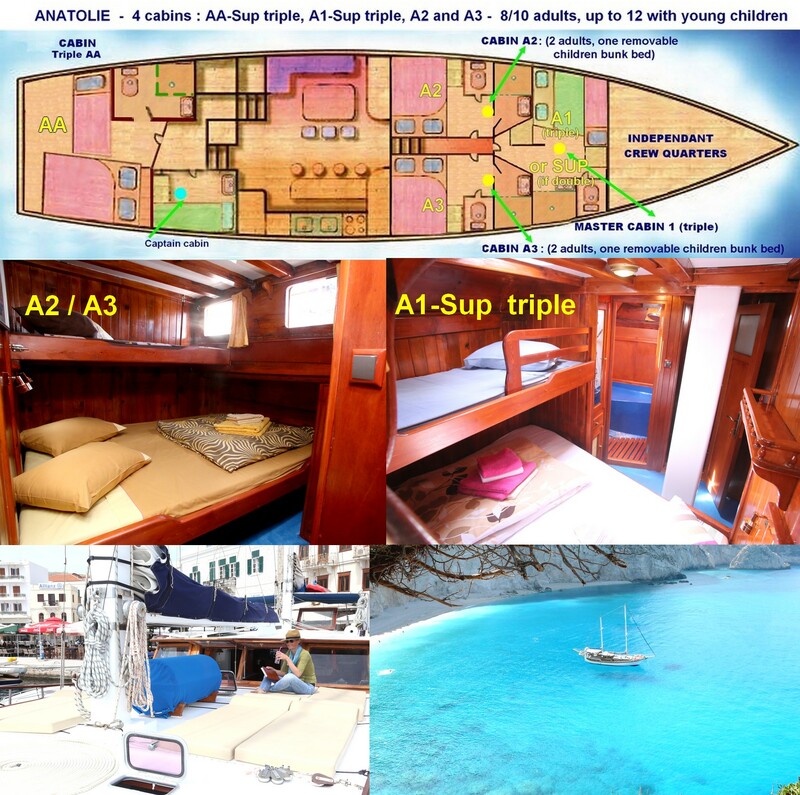 31 Aug. to 7 Sept.
ANATOLIE navigates in the Cyclades in middle season and in the Ionian islands during July and August (during these 2 months Cyclades are too windy). The 3 class A cabins of the Anatolie have one private WC AND one separate private shower, and the main bed is 160 cm wide. The C1 cabin has a narrow double bed (maximum 130cm large), reduced headroom and a small WC-toilet with shower on the sink. The B1 cabin has a large double bed but a reduced headroom too. (as during these 2 months Cyclades are too windy). All the cabins have a 160 cm wide bed and a shower box in the toilet except the A8 cabin. SYROLANA navigates in the Cyclades in middle season and in the Sporades islands during July and August (during these 2 months Cyclades are too windy). The B2 and A cabins of the Syrolana have the same dimensions and same private toilet-shower, but the A4 has twin small beds (180 cm long) which can be changed to one large bed. Their headroom is normal. The SUP2 cabin has a VERY large bed (if you are very tall, take this cabin) and one single bed in the same level. There is a cabin-shower in the bathroom. The VIP cabin has 2 bathrooms, one with sink and toilet, the other with sink and cabin-shower. What is included & what is not?